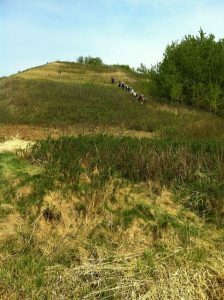 East Battle River Valley, “Rest and Be Thankful,” and Were We Thankful! 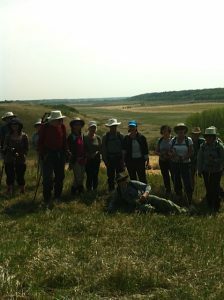 Under David’s leadership and sunny skies, 19 intrepid hikers, from New Norway, Camrose, New Sarepta and Edmonton, traversed the challenging Easternmost hike of the meandering Battle River. Although we had to trek up and down gully after gully, the views of the river valley were spectacular. When we rested for lunch on “Rest and be Thankful” hill, we were indeed thankful —and rested— as long as our leader (who forgot his lunch) allowed. We imagined the Grand Trunk Railway trestle bridge that once spanned the entire valley, we admired the red tail hawks riding the wind currents and ignored the plentiful seagulls squawking overhead. At lunch Elizabeth, aka Madame Butterfly, recognized the rasping, cricket-like sound of a Clay Warbler and the group pointed out several Cabbage Butterflies, a Mourning Cloak or two and a Swallow Tail Butterfly. The musky-sweet scent of blooming Silver or Wolf Willow was distinct but not overpowering, as it can be. 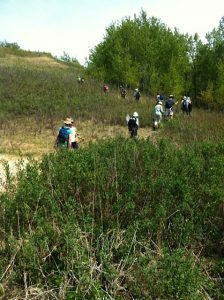 Other distinctive native Alberta flora caught our eye: Three Flowered Avens or Old Man Whiskers, Heart Leaved Alexanders, False Toad Flax, lots of Saskatoon still in bloom as was the Chokecherry, Gooseberry and several types of currants. Also identified was Silverweed, Buffalo Bean or Golden Bean, Mouse-eared Chickweed and most spectacularly, Shooting Stars. Further, we saw evidence of early spring blooms on the Crocuses and some Prickly Pear Cactus came along for a ride on some of the hiker’s socks. There was no sign of the Milkweed that was planted along the route by previous irreverent WTA hikers (who will not be named). When we looked back over the valley as we finished our hike, five sleek bay horses suddenly appeared at the top of the ridge to show us that they knew we were in their pasture and to thank us for the rare entertainment that we brought to the East Battle River Valley. Wish I was there to see the horses. It sounds wonderful!